Each archive entry shows information on a project in the archive. Only authorized users can see the projects. Click the Archive in the lower left corner of the Projects page that is also a home page. 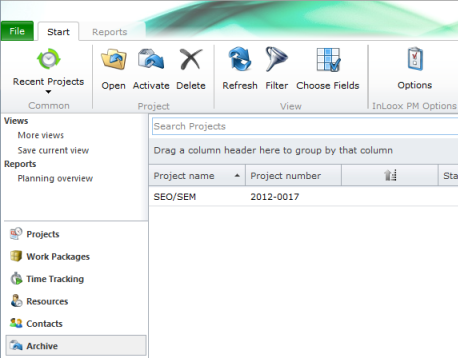 Open the last project edited Click Recent Projects in the Common group. Choose from the drop-down list the last project you worked on. This list displays the last ten recently opened projects. Open a project Choose one project from the list and click Open in the Project group. Restore project Choose a project from the list and click Activate in the Project group. The restored project is displayed in the project list that can be opened by clicking Projects in the lower left corner of the page. Delete project Remove a selected project by clicking Delete in the Project group. This project is now placed into Recycle Bin. Click Project in the lower left corner of the page to find it. For more information about deleted projects, see View, restore, or delete projects in the recycle projects view. Refresh All changes will be updated and the view reloaded via the Refresh button in the View group. Search for the projects by using a filter In the View group, click Filter to quickly find the needed entry. For more information on how to use the filter feature, see Search and find projects, in the Use filters section. Now you see the projects that correspond to the defined criteria. Add additional information to the archive view Click Choose Fields in the View group to sort and organize the entries by selected data. On the Choose Fields dialog box, click one field, e.g. Closed, and drag it into the column headers. Reset the fields via Drag and Drop back into the dialog box. Open InLoox PM options Click Options in the Tools group. Here you can change the basic settings for InLoox PM. Open a project Double-click on one project in the list or right-click on the item to open the context menu and choose Open from the list. Group the archive list Group the archive list for better clarity. Draw the column name into the area above the list. The context menu provides you with almost all basic features that are also on the InLoox PM Web App Ribbon, such as Open, Delete, Activate and Refresh. It has also such features as Expand and Collapse All Groups (is only for grouping),Filter and Choose Fields to adjust the view. Right-click in the list to open the context menu. Adjust the archive view - InLoox • Copyright 1999-2019 © InLoox, Inc. All rights reserved.